Muswellbrook Animal Shelter has been criticised by the pet loving community, for killing two dogs last month. Muswellbrook Shire Council has defended itself in the wake of social media backlash after two dogs were euthanised last month... condemnation followed the deaths of two rehomable canines, Bandit and Buddy, on April 21. Council’s manager for integrated planning Fiona Plesman said all the business practices at the Muswellbrook Animal Shelter are RSPCA approved and had been correctly applied in this instance. “It’s certainly disappointing – we don’t want to euthanise dogs,” she told the Chronicle. So, let me just stop you there. This wasn't euthanasia. Euthanasia is the ending of a suffering animal's life, when that animal has a poor prognosis for recovery. It is a humane and compassionate act. 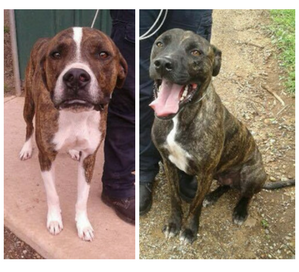 What Muswellbrook Animal Shelter did was kill these healthy, adoptable dogs. It was not a humane act. It was not a compassionate act. “Bandit and Buddy were surrendered by a woman on April 6. “She paid the money ($102) and signed the surrender form, stating she didn’t want them because her kids didn’t play with them anymore. Ms Plesman said 33 rescue groups, and individuals, were contacted but no-one responded. “Photos of Bandit and Buddy were readily available; and notifications [about the pair’s plight] put up on April 11, 19 and 20,” she explained. “We even send out a regular internal message to staff – there was plenty of notice over the two-week period. Okay, so two dogs are surrendered to you and you threatened the owner that you would kill her dogs. Nice. We are all now feeling nice and reassured that you were keen to protect these animals from harm... like we pay you to do. Then, the woman paid $100 to care for her dogs. And you sent an email to see if rescue groups would do your job for you. You put up 3 facebook posts. And when people didn't knock you down in the rush to adopt these brindle bull arabs, you shrugged - whatarewesupposedtodo? - and then you killed them. That seems totally reasonable. What else COULD you have done? I mean, I suppose you could have listed the dogs on PetRescue.com.au where adopters look for animals. OR, you could have taken that $100 and immediately run a colour ad in the local newspaper for both the dogs. OR, you could have taken the dogs along to a pet shop on a weekend and displayed them as available for adoption. OR you could have done ALL of these things. And I'm literally just taking five minutes and thinking off the top of my head things I would personally choose to do, rather than choose to kill two healthy, adoptable dogs. “Every care and attention was paid to the dogs, as we do with all the dogs at the shelter. “However, Bandit and Buddy weren’t doing well; they were fretting and their weight was dropping. Dogs who are getting "every care and attention" drop weight and start to break down behaviourally in just a matter of days? Just WHAT ARE YOU DOING TO DOGS THERE? What "care" and "attention" are they getting, to cause them to deteriorate so rapidly? And why is the community paying you to torture dogs? Ms Plesman said the criticism had taken its toll on the employees. “They’re unhappy by what’s transpired [on social media],” she admitted. “The rangers and staff love the animals – it’s a hard job. “But, you have to ask the question: why do people take on dogs and give them up? If you were running a clothing store and people kept dropping off dogs, now that would be... weird. But are you seriously running an ANIMAL SHELTER, while being simultaneously baffled as to why the public keep bringing you their unwanted animals? I mean COME ON. Why are we paying you people? and you're not even keen on actually running a shelter - it's like you think "animals" are an unfortunate inconvenience to the job. .... Muswellbrook Animal Shelter is open between 12:00 and 2:00pm weekdays, or by appointment. The "shelter" is closed weekends and public holidays. ... council will be providing a new shelter in the near future. More than a new shelter, this community need new shelter staff - ones willing to do something. Anything. Before choosing to end a healthy animal's life. This community needs a shelter who cares.